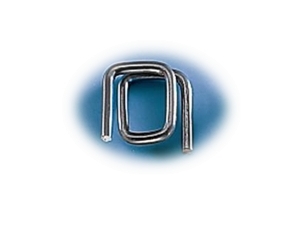 Wire Buckles are used with a specialised tensioning tool (P353) to tension PP, PET, Polywoven and Cord Strap around a variety of items including drums, crates , piping and more . No sealing tools are required. Just feed the strapping through the wire buckles and pull tight (the one side locks and the other remains “open”) .Next insert the open end of strapping into the P353 tensioner tool and ratchet until tight. Non Slip Wire buckles are more secure than Knurled buckled and reduce slippage in transit. .